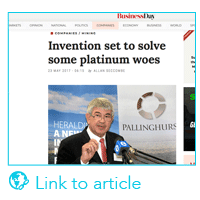 In a Mining Weekly Online interview Arné Frandsen and Brian Gilbertson from Sedibelo Platinum Ltd discuss the adoption of the Kell Process as part of their strategy to reduce costs and environmental impact. Zimbabwe's mining industry is emphatically open for business as one hundred and fifty-five participants learned at the first ever "Zimbabwe is Mining" seminar on June 6 in Toronto - the world's mining finance capital. On Wednesday the Government signed an agreement with an Australian company, Kelltech, to build a $300 million platinum refinery in the country. Kelltech will set up a joint venture company with Zimbabwe Mining Development Corporation and local partner Golden Sparrow. Expected to begin next year, construction work is scheduled to take 24 months. 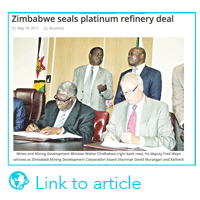 The Zimbabwean government yesterday signed an agreement with Australian company, Kelltech, for construction of a $300 million platinum refinery just about two months after Cabinet approved the project. The Zimbabwean cabinet has today agreed to a proposal by South Africa’s Pallinghurst Resources and the Industrial Development Corporation (IDC) that will lead to $500m in beneficiation investment which, at a single stroke, resolves more than a decade of regulatory uncertainty for foreign platinum miners operating in the country. 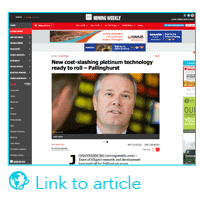 Pallinghust group platinum mine Sedibelo is now ready to implement a new technology that will send platinumprocessing costs hurtling down the cost curve. Mining Weekly editor Martin Creamer joins senior deputy editor Tracy Hancock in studio to talk over the significance of this development. 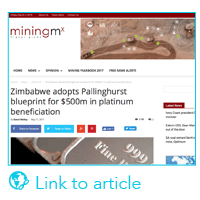 Pallinghurst Resources through its platinum investment Sedibelo Platinum Mine, together with Lifezone and the Industrial Development Corporation (IDC) are to press ahead with the commercial development of its Kell Platinum Beneficiation Technology that is expected to transform the platinum group metal (PGM) sector in southern Africa. Years of diligent research and development have paid off for Pallinghust group platinum mine Sedibelo, which is now ready to implement an amazing new technology that will send platinum processing costs tumbling down the cost curve, use a fifth of the electricity currently needed for smelting and throw caution to the wind when it comes to mining chrome-containing platinum ore.
Industrial Development Corporation (IDC) divisional executive: mining and metals industries Abel Malinga enthuses about new platinum processing method that slashes electricity consumption by eliminating the power-guzzling smelting step in the processing of platinum-group metals (PGMs).